Several times a year, members of my astronomy society spend a weekend or more at a dark site on the north-east coast of Anglesey having unobstructed views to the south and south-west. On Friday 18th May we were blessed with a wonderfully clear sky – albeit not getting dark until 11pm or so! 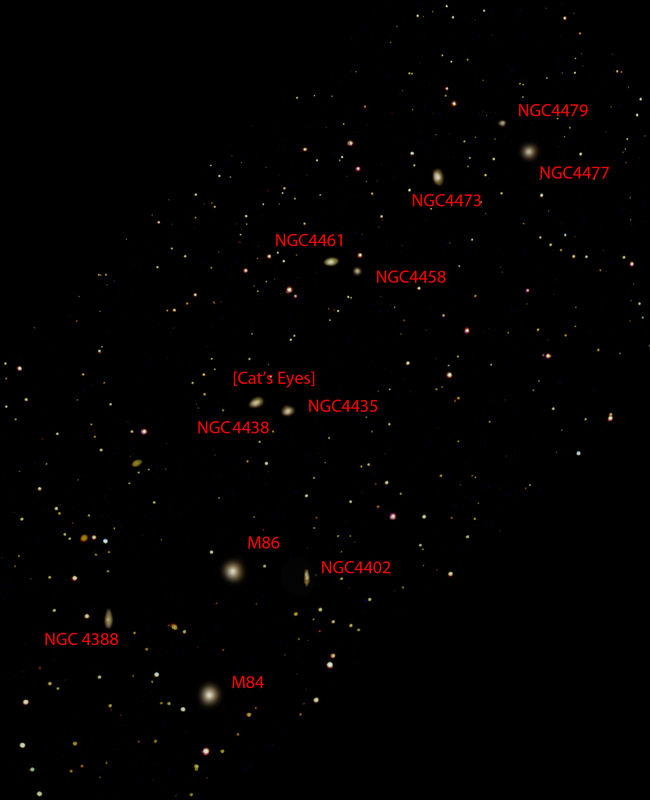 Using Sky Safari I had seen that the Virgo cluster of galaxies would be visible in the south-west after dark and decided to attempt to image part of the Virgo cluster. As it covers a substantial area of the sky I wanted to image with the widest possible field of view that my telescopes and cameras could provide. The obvious choice for a telescope was the TS 65 mm, 4 element, astrograph which is reviewed elsewhere in this digest. This is designed to cover a full frame (36 x 24 mm sensor). My only full frame sensor is within my Nikon D610 camera so this was used. Perhaps as the telescope is designed for imaging, it is the only refractor that I have which will come to focus without having to use a focuser barrel extender. Being an astrograph using a FL-53 element in a triplet objective and a singlet field flattener part way down the optical tube, it should provide pin-point stars across an unvignetted field of view. It does not quite achieve the latter but is pretty close. 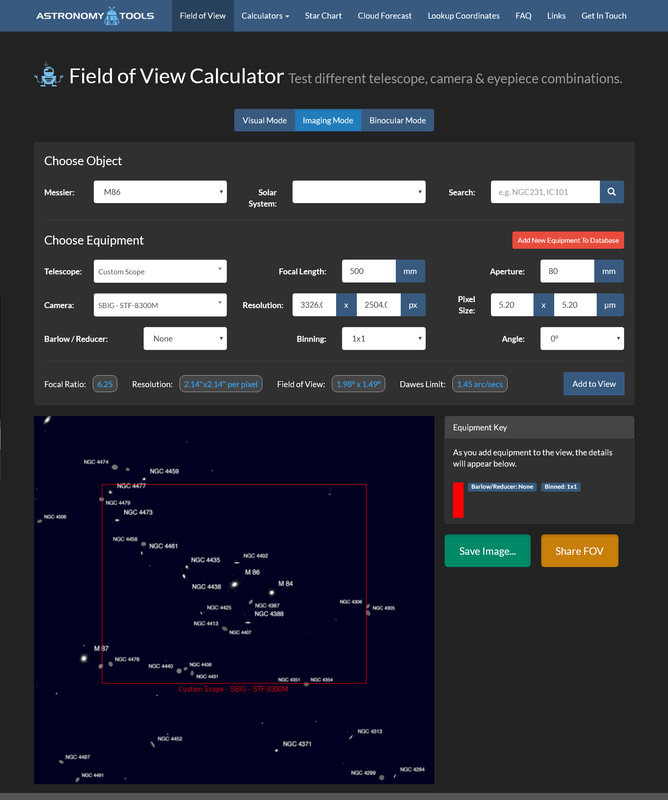 provides an excellent way of checking the field coverage of a telescope/camera combination. This shows the result when using a Nikon D750 (which has the same full frame sensor as my D610) and centred on Virgo A, M87, the brightest galaxy in the cluster. As described elsewhere in the digest, I controlled the camera using the DSLRdashboard App on my Samsung tablet. This acts as an intervalometer and, with a full screen live display, makes focussing easy. The choice of mount was easy – my iOptron Minitower. It is small and compact, has a built in GPS system to set the location and time, and, once aligned, has excellent ‘GOT0’ ability as will be proven later. This really is a superb ‘Get up and Go’ mount and is described in detail elsewhere in this digest. There is, of course, one down side in that it being an alt/az mount it will suffer from ‘frame rotation’. The program ‘Deep Sky Stacker’ which I use to align and stack the frames will automatically ‘de-rotate’ frames before stacking so that the only consequence is that parts of the image towards the edges will have had somewhat less exposure. Jupiter was in the south and made an excellent object on which to align the mount. The mount has to be aligned due south with the telescope vertical. I only knew the approximate direction of south but this was no problem. I ‘selected and slewed’ to Jupiter which, as expected, was not in the field of view using a 2-inch wide field eyepiece. However, the elevation should be correct and so slewing the mount in the appropriate direction in azimuth immediately brought Jupiter into view. Having centred Jupiter in a higher power eyepiece, I then ‘synchronised’ the mount to the object. [Parking the mount will then park it facing due south, so an accurate direction south can be found.] Using a 65 mm aperture telescope with a focal length of just 420 mm, the image of Jupiter and its moons was pretty small in the frame but 4 moons could be seen with Io just beside Jupiter’s limb. 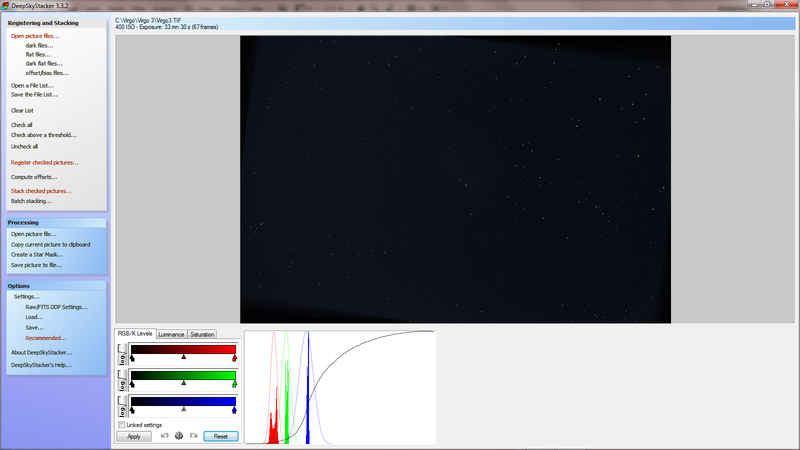 I then set DSLRdashboard to take continuous 30 second exposures. 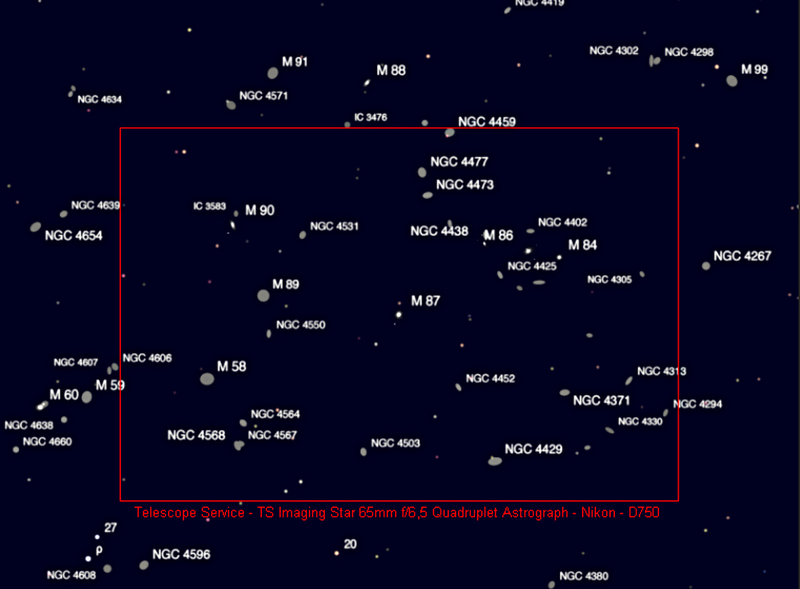 Imaging continued until M87 had become obscured by buildings in the south-west. A total of 67 frames had been captured in raw and Jpeg from the time that darkness ‘fell’. I did point out that the TS refractor does exhibit a little vignetting in the extreme corners which can, of course, be corrected by using a set of flat frames. I had produced a number of flat frames taken earlier when it was quite light. These were converted to monochrome and imported into Deep Sky Stacker along with the light frames. The 67 frames were then de-rotated, aligned and stacked in Deep Sky Stacker using the average stacking mode. The histogram produced of the result, as seen in the screen shot below, was unlike any that I have seen before. From my light polluted home location, I have a red peak to the right but, for this image, the peak to the right was blue – due, of course, to the residual light in the sky as true ‘Astronomical Darkness’ would only exist for an hour around 1 am BST − well after these frames had been taken. This light is still a form of light pollution and will thus have obscured the fainter outer parts of the Virgo galaxies. When stretched, the pass of a satellite was seen across the image. There are two ways this can be removed. If, instead of the average stacking mode, the ‘Median Kappa Sigma’ mode is selected it will remove any pixels that veer too far from the average. This does, however take some processing time and the alternative which may well be quicker is simply to scan all the JPEG images and find the one with the satellite present. (If it is apparent in the final image, it will be fairly obvious.) I did this and simply deleted it so it would not figure in the averaged stack. A little stretching was done in ‘levels’ with the central slide moved left to the 1.20 position as shown in the screen shot below. This was made an ‘action’ so could be then achieved with a single (function) key stroke. The blue skylight became obvious and to remove it, the image was duplicated and the ‘Dust and Scratches’ filter applied with a radius of 24 pixels. 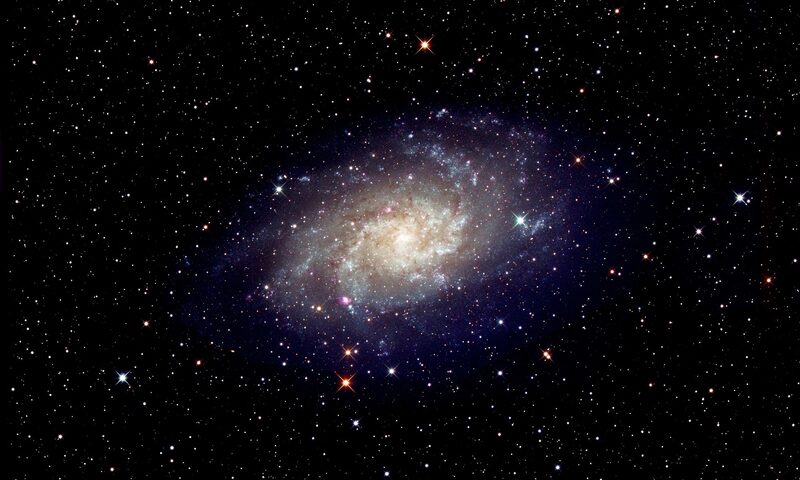 This removed the stars and galaxies leaving just an image of the skylight which was then removed from the initial image by flattening the two images using the ‘Difference’ blending mode. The resulting image could then be stretched a little more. 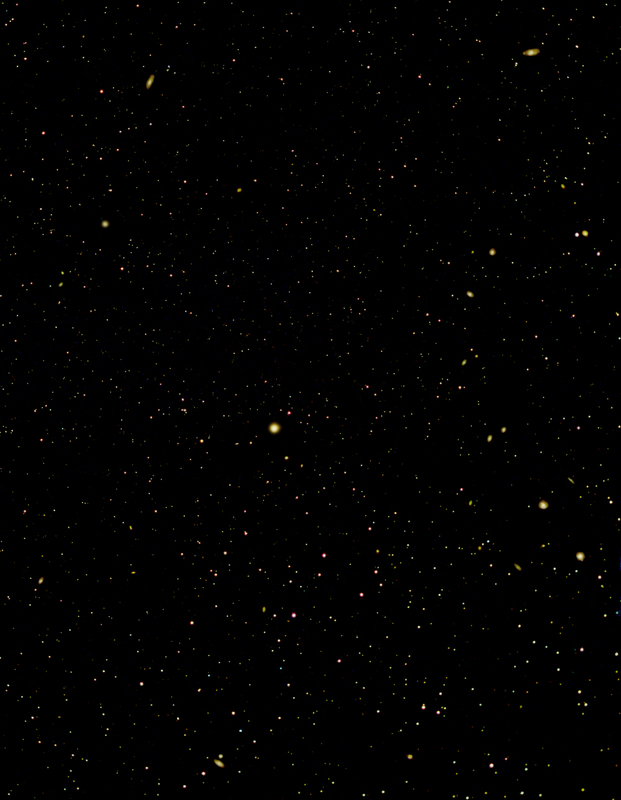 A technique I have used (as with some others) when imaging nebulae such as the Andromeda Galaxy or the North America Nebula is to separate out the nebula and stars into two frames, enhance the nebula by increasing the ‘local contrast’ of the image and then, using the ‘Screen’ blending mode put back the stars into the nebula image. 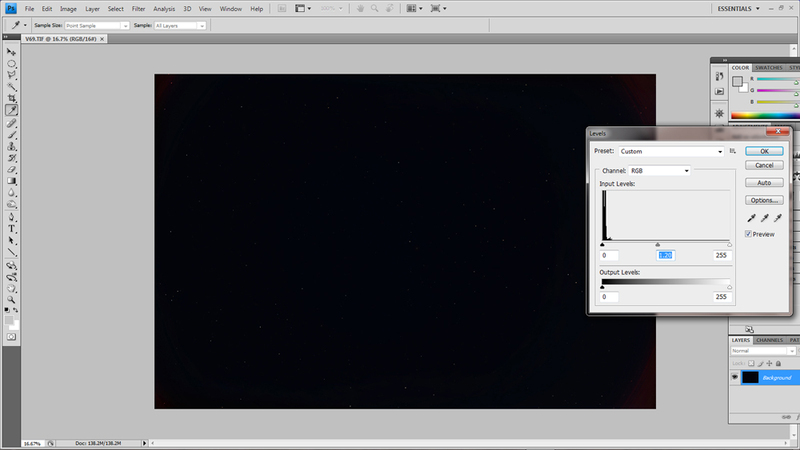 However as the image is of the nebula, not the stars, using the ‘opacity’ slider one can reduce the star’s brightness somewhat so that the nebula stands out better. In this image, I have made a mask which covered the areas surrounding each of the visible galaxies, inverted it (so that the galaxies were not included in the mask) and then reduced the brightness of the stars. This allowed the galaxies to stand out better from the star field. This first imaging exercise of the region encourages me to use a longer focal length telescope and cooled CCD camera to image just the region of Markarian’s chain from a dark location in late February or April during astronomical darkness. One should then be able to bring out some of the fainter outer regions of, for example, the galaxy M86 – but this will have to wait until next spring. 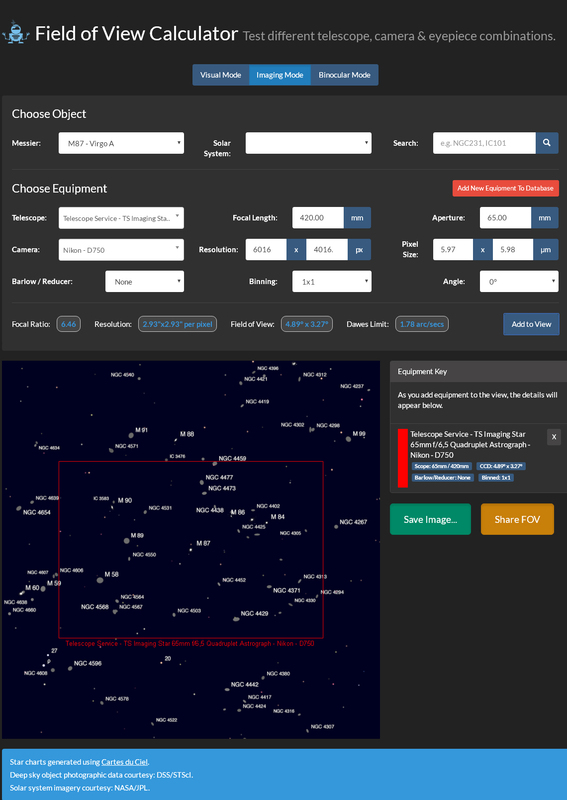 The field of view calculator suggests that a good pairing would be to use my 80 mm, 500 mm focal length, refractor allied to my SBIG 8300M CCD camera.